This class will be held the week of July 23-27, 2018 to coincide with the Annual Grand Lake Classic Boat Show on July 28. Class participants will display their finished SUPs on Saturday, July 28 alongside the classic wooden boats which will also be on display. ​In this one-week class, you will build either a 12-1/2-foot or 14-foot Kaholo paddleboard. The Kaholo 14 is better for larger paddlers, 190lbs or more (or those who might carry along dogs or small kids). The 12-6 is more compact, best for smaller-statured paddlers, and it fits in several increasingly popular racing classes. 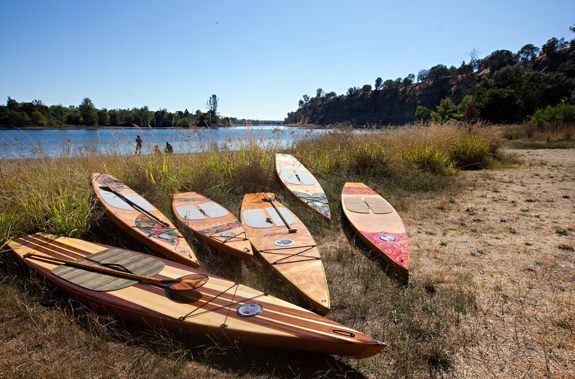 There are no other SUP boards in the world that are easier for a first-time boatbuilder. Participants will have the option to build their own board or join with other students to jointly build a class board. Class size is limited to 8 participants and registration must be completed by June 28 in order to allow for ordering of class materials. For further information or questions, contact kenfucik@comcast.net or call 970 305 7132. Sign ups can be completed on the Registration page. Participants can stay at local hotels, or camp out in the Rocky Mountain National Park, right next door!